KIO Networks brings the best of bread datacenter’s solutions in LATAM. Our Datacenters in México Santa Fé and Querétaro are Tier IV by design. We are in Compliance with PCI (Payment Card Industry) Security standards in our most important facilities. Most KIO’s Datacenters offer 99.999% of availability thanks to our 2N design: Two independent electro-mechanic lines to feed customer’s equipment safely. These independent lines are delivered through two, indeed, independent power distribution units into the racks. Of course, all this redundancy isn’t worth if your servers are not configured with two independent power supplies… and this’s it, the exact tone of this post. The intended take-away of this note: how much resiliency you can get from a facility and a hardware stack, and why this isn’t worth a penny is your application is not logically and virtually defined in the same level of redundancy from the very end-user to the databases and objects. Please, I ask you you grab some patience and stay reading this note – and read the other two that will come the next Tuesday -. 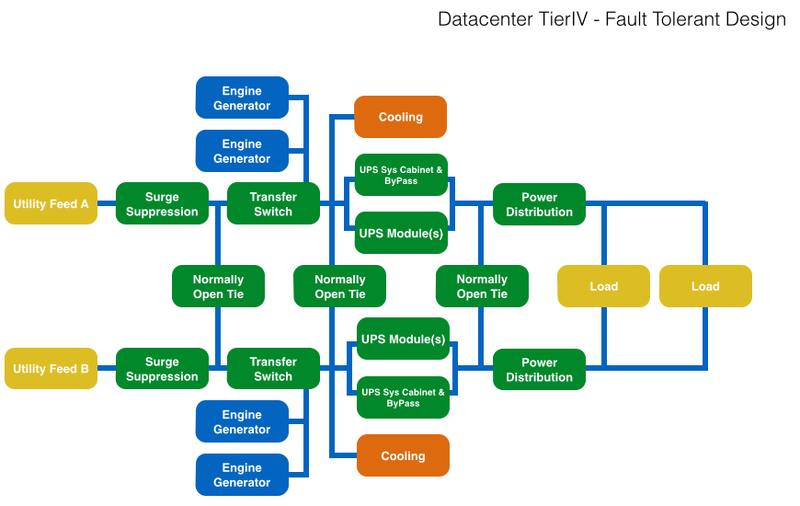 Let’s start understanding how a fault tolerant datacenter’s design works. As you can see in the previous picture, if you are in KIO Networks. You can get an awesome redundancy from our facilities. From left to right we’ll start from the Utility Feeds, one per line, both are connected to the datacenter from opposite sides of the facility and are sourced from different and independent power sub-stations located geographically far away one each other. Next, we’ll have surge suppression system to eliminate undesirable voltage spikes/surges and protect your heavy-duty power and cooling systems from any sort related damage. Then, we have power transformation. Every circuit has its own power transformation system. We have different “ties” that are normally opened. These “ties” bring more flexibility in case we have to face any failure and replace the broken component with the other circuit’s one. Generators support us when utilities don’t work properly. Generators require maintenance and of course you need more than one to support every power line or entire datacenter’s load. You can not move transparently from the utility feed to its respective generator if you don’t have some UPS systems (Uninterruptible Power Supply) with enough batteries to support a minute all your datacenter’s load. Any UPS system requires maintenance, then bypass systems are required to do it without an unnecessary risk. Of course, you will have to backup the power of your cooling systems. They could require between 20% or 50% of your overall power consumption depending on your PUE (Power Usage Effectiveness) achievement. Cooling is a very important resource like the load itself, if you want to keep your equipment safe and running. …. Uh! Oh! forget to mention that all components are isolated inside independent rooms to avoid any collateral damage between systems due to any aggressive failure of any one of them . This is what we call a tremendous resiliency to stand any sort of trouble. After this short overview, you can be sure that we have the best in class technology to care your IT stuff, maybe one of your most important asses today. Later, if you want to rent instances from any of our clouds, you bet that any of our configurations has gotten the required redundancy to support any hardware failure. You can see the next picture. This is just an example. you can get more information about our last architectures at koolfit.mx. All our shared clouds’ infrastructures are installed in our datacenters with the just mentioned redundancy. 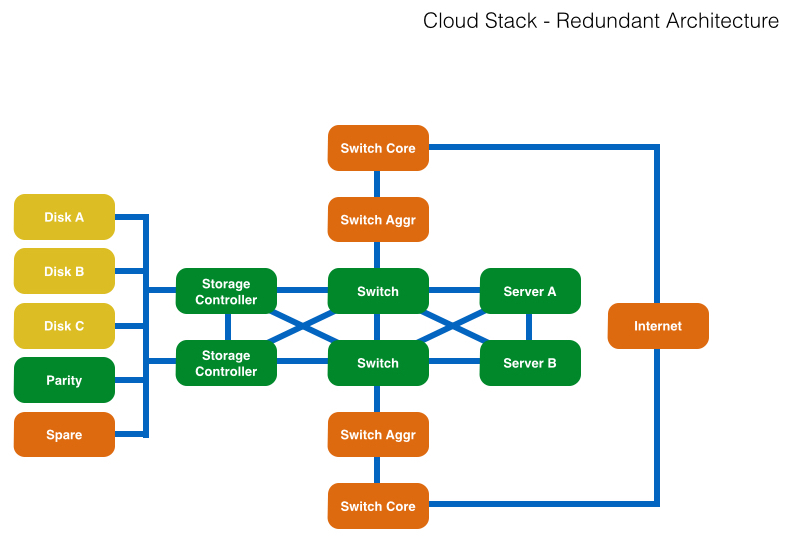 I will describe every component of this cloud stack configuration in my next note. See you then and be nice!.